The promotion of standards and guidelines to advance quality assurance and control is an integral part of the health care sector. Quantitative methods are needed to monitor, control and improve the quality of medical processes. Statistical Development of Quality in Medicine presents the statistical concepts behind the application of industrial quality control methods. Filled with numerous case studies and worked examples, the text enables the reader to choose the relevant control chart, to critically apply it, improve it if necessary, and monitor its stability. Furthermore, the reader is provided with the necessary background to critically assess the literature on the application of control charts and risk adjustment and to apply the findings. Contains a user-friendly introduction, setting out the necessary statistical concepts used in the field. Uses numerous real-life case studies from the literature and the authors’ own research as the backbone of the text. Provides a supplementary website featuring problems and answers drawn from the book, alongside examples in Statgraphics. The accessible style of Statistical Development of in Clinical Medicine invites a large readership. It is primarily aimed at health care officials, and personnel responsible for developing and controlling the quality of health care services. However, it is also ideal for statisticians working with health care problems, diagnostic and pharmaceutical companies, and graduate students of quality control. Per Winkel - Senior researcher at the Copenhagen Trial Unit, Centre for Clinical Intervention Research at the University Hospital of Copenhagen. Professor Winkel has worked in this field for 40 years, with over a decade’s teaching experience. He has contributed to several international textbooks, has published a Danish textbook in 2002, and published over 150 papers in international journals. Niew Fan Zhang – Manager of Metrology Statistics and Computation Group, Statistical Engineering Division, US National Institute of Standards and Technology. Dr Zhang has thirty years experience in the field, in both teaching and research. He has published over 50 papers in various international journals, and has won numerous awards for engineering achievements and statistical research. Introduction – on quality of health care in general. I.1 Quality of health care. I.2 Measures and indicators of quality of health care. I.3 The functions of quality measures and indicators. 1 Theory of statistical process control. 1.1 Statistical foundation of control charts. 1.2 Use of control charts. 1.3 Design of control charts. 1.5 Analysing the properties of a control chart. 1.6 Checklists and Pareto charts. 1.7 Clinical applications of control charts. 1.8 Inappropriate changes of a process. 2.1 Control charts for discrete data. 2.2 Control charts for continuous data. 2.3 Control charts for variable sample size. 3.1 Shortcomings of Shewhart charts. 3.3 Exponentially weighted moving average (EWMA) charts. 4 Control charts for autocorrelated data. 4.2 Tests of independence of measurements. 4.3 Control charts for autocorrelated data. 4.4 Effect of choice of process standard deviation estimator. 5 Tools for risk adjustment. 5.3 Regression on continuous outcome measure. 5.4 Logistic regression on binary data. 5.5 Assessing the quality of a regression model. 7 Risk-adjusted comparison of healthcare providers. 7.2 Statistical risk adjustment of observational data. 7.3 Perils of risk adjusting observational data. Part III Learning and Quality Assessment. 8.1 Assessing a single learning curve. 8.2 Assessing multiple learning curves. 8.3 Factors affecting learning curves. 8.4 Learning curves and randomised clinical trials. 9 Assessing the quality of clinical processes. 9.2 Benchmarking of processes in statistical control. 9.3 Dealing with processes that are not in statistical control in the same state. Appendix A – Basic statistical concepts. A.1 An example of random sampling. Appendix B – X and S chart with variable sample size. Appendix C – Moving range estimator of the standard deviation of an AR (1) process. 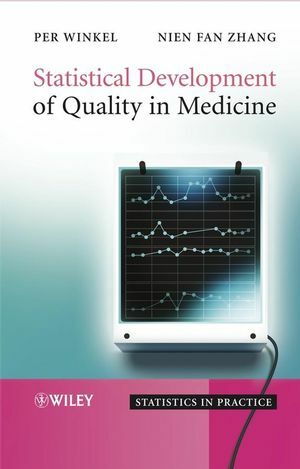 Statistical Development of Quality in Medicine Visit for problems and solutions.